In a 40-year career he won over 100 Group 1 races (one of just four to do it), including two Melbourne Cups. 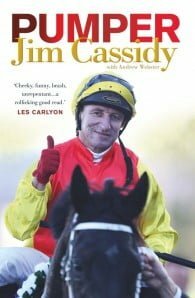 Cassidy had also been banned from racing for five years (later reduced to 21 months) for his part in the Jockey Tapes scandal. Broke from legal bills and exiled by the racing fraternity, Cassidy worked as a brickie and ate once a day to get by, but rediscovered his love of horses in an odd way: volunteering at his young daughters’ Pony Club. Then Jack Denham, crankiest trainer alive, offered Cassidy the ride of a lifetime. With Pumper up top, Might And Power won the Caulfield-Melbourne Cup double in 1997. Along the way, Cassidy rode the highs and lows to become the track’s most beloved and controversial character. His horse whispering, gambler’s charm and razor wit endeared him to punters, trainers, fellow jockeys… but rarely officialdom. Nevertheless, suspensions, friends in places high (millionaires) and low (underworld figures), and honest opinions always made The Pumper front and back page news. Jim Cassidy (b.1963) is the third ever jockey to win over 100 Group 1 races. Born in Lower Hutt, New Zealand, he won the 1983 Melbourne Cup on Kiwi and the Caulfield-Melbourne Cup double in 1997 on Might And Power. He is a three-time winner of the Australian Derby (1990, 1993, 2009). He retired from racing in 2015. Cassidy has three daughters and lives in Sydney.